Ein Training für Yogalehrer und interessierte Yogaschüler. Chronische Schmerzen entstehen oft aus unseren Angewohnheiten und Bewegungsmustern. Sind diese mal zu einem festen Teil unseres Körpers geworden beeinflussen sie unser Wohlbefinden und unsere Gesundheit. Sobald wir jene Muster einmal erkannt haben, können wir sie in unserer Yogapraxis durch bewusstere und heilsame Bewegungsabläufe ersetzen. Dieser Workshop vermittelt ein grosses Wissen über die Zusammenhänge zwischen habituellen Körpermustern und deren Auswirkungen auf den Körper und das breite Spektrum an Möglichkeiten einer therapeutisch ausgerichteten Yogapraxis. Das Erkennen allgemeiner Bewegungsmuster, die zu Schmerzen im Alltag sowie in der Yogapraxis führen. Einfache Interventionen und Anweisungen, wie man diesen Bewegungsmustern in der Praxis angemessen begegnet und sie durch heilsame Bewegungsabläufe ersetzt. Spezifische Körperstellen, die von diesen Mustern beeinflusst sind: Füsse als Basis, Knie und Hüftgelenke, Kreuz und untere Rücken, Nacken und Schultern, sowie Ellbogen und Handgelenke. Dies inkludiert den Umgang mit typischen Problemen im Bewegungsapparat, wie schmerzhafte Schultersteife (frozen shoulder syndrom), Verletzungen an der Schultermanschette, Engpass-Syndrom (Thoracic Outlet Syndrome), und verwandte, nervenbezogene Schmerzen im Oberkörper, Schmerzen und Instabilität des Ilio-Sakral-Gelenks, und typische Fuß und Kniebeschwerden. Das Hauptziel des Workshops ist es, ein weitreichendes Verständnis für Yogastellungen zu vermitteln und dieses in die eigene Yogapraxis, aber auch in den Yogaunterricht durch genaue, leicht verständliche Anleitungen einfliessen zu lassen. Der Workshop vermittelt eine Fülle von Hilfestellungen für Schüler mit chronischen Schmerzen. Das vermittelte Wissen aus dem Training “Therapeutic Wisdom” kann leicht in jede Yogapraxis integriert werden. Um das theoretische Wissen in die Praxis umzusetzen, werden die Lektionen in kurzen Yoga-Sequenzen zusammengefasst, und gemeinsam durchgeübt. Die Tage 1 & 2 widmen sich der Hüfte und den unteren Extremitäten, Tag 3 & 4 decken Nacken und Schultern und Probleme des Oberkörpers ab. Jeder Tag wird mit einer Yoga Nidra Session abgeschlossen. Der Workshop findet im Zentrum Wiens statt. Details erfahrt ihr kurz vor dem Workshop. Die Workshoptage können auf Anfrage auch einzeln gebucht werden. JedEr TeilnehmerIn erhält auf Wunsch ein Zertifikat, welches für 24 Stunden “Continued Education” bei der Yoga Alliance in Anwendung gebracht werden kann. Der Unterricht ist in leicht verständlichem Englisch gehalten. Fachbegriffe werden in der Gruppe übersetzt. Chronic pain too often arises from habits and patterns of movement that have become part of the ‘story’ of our body, impacting our health. Technically these are called ‘movement impairment syndromes‘, and these are stories that can be rewritten once they are recognized. Yoga gives us the practice by which to do so. This training will be an initiation into seeing these patterns as they give rise to difficulties and injuries in yoga practice and as a way of understanding pain complaints and injuries that students experience in everyday life.. The training is structured to help teachers understand more deeply the therapeutic rationale behind alignment and action instructions in yoga poses — and to know when these instructions are helpful and appropriate, and when variations or a different emphasis are necessary. The instructions are clear, specific and user-friendly, and backed up by knowledge of the anatomy involved in the movements as well as an understanding of the common therapeutic problems that bring students to yoga seeking help. The feet provide the foundation; and the actions of the feet profoundly affect the 3-dimensional movement of the knees as well as the hips. We’ll begin with the feet, and the fundamental actions for maintaining the integrity and stability of the feet as a foundation — and how this is applied in the many different forms of poses in yoga. Our initial focus will be on the influence of the deepest muscles of the spine — the multifidi — which influence the movements of the sacrum, and are a central factor in sacroiliac and low back pain. Moving outward, we will build upon that, looking at the sheaths of fascia and muscles nested within them that profoundly influence low back health. This has very concrete and practical implications for our understanding of asana and the dynamics of asana, with applications in all classes of asana. 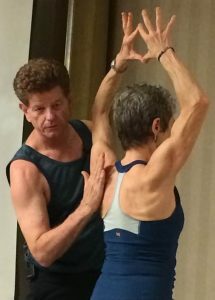 We will focus on the fundamental forms of movement impairment impacting low back health — both for the inflexible as well as the hypermobile — with clear strategies for working with both patterns in asana practice. This will include not just the health of the lumbar spine and sacroiliac joints, but will also include an exploration of sciatic pain, which radiates from the gluteals down through the leg and sometimes into the foot. Our treatment of this topic will include tools for assessment of postural and movement patterns, corrective exercises and sequencing, and related topics of sciatic pain and hip joint health. Just as the feet, with the actions maintaining their arches, support the health of the knees and hips, our hands likewise have arches — and actions practiced to maintain the health of the wrists will also support the health of the elbows and shoulders, facilitating the opening of the shoulders while protecting the health of the rotator cuffs. The principles covered for working with the head and neck in asana and pranayama will naturally lead us into working with the shoulders, and seeing how these principles apply in all classes of asanas. This will take us further in our understanding of what we learn through postural and movement assessment, and exercises for improving upon these patterns. Some very important support materials are provided with the training to ensure that you can take in the information and work with it even when the training itself is over. An illustrated manual is provided for you with the training, which includes the teaching points of the training, illustrated and in detail, with space for you to take notes as we go along. This reduces your stress from worrying about taking extensive notes, so that you can be fully present to experience what is being covered in the training. The course is open to all levels of yoga practitioners. It can be booked as an entire 4-day program or for single days. The Workshop will take place in the very centre of Vienna. More details will be provided closer to the workshop. Upon request, you can book single days.